...So, I should really be planning my English lessons for this week but I am on the computer instead. Everything's good here in Nouadhibou. Thanksgiving was great. We had 2 big meals: one on Thursday afternoon with a couple friends from Mauritania and one on Friday evening with the other local PC vols. Lots of chicken, bread, stuffing, potatos, veggies and Katie's apple pie was incredible. In addition, I got to talk to many family members on Thurs. and Sat. On one such call (with my dad) on sat. evening I even got to overhear the live tv moment and ensuing jubilation of KU's winning play over MU. Fantastic. If you ever want to witness a great sports moment, make sure I am out of town, because that is usually when they happen (2008 KU b-ball champs excluded). Classes are going well but this is the last week before the traditional Muslim holiday of Tabaski. After the holiday I only have another 2 weeks before the end of the first trimester and the first big test. Considering school didn't really start until November, it feels a little premature. I'm sure the other RIM ed people can empathize. Today Mike and I did laundry, and I think we'd waited a bit too long because we'll probably have to do more again on Tuesday since we didn't completely finish. We usually try to do laundry about twice a week. However, this past week I've been feeling a bit under the weather due to a head cold, and so we procrastinated until today. Doing laundry in Mauritania is a bit different than in the United States, where machines do most of the work. 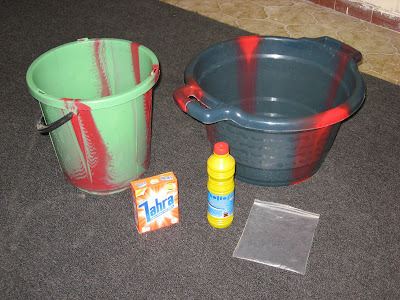 In Mauritania you wash all your clothes by hand in buckets (like the ones in the picture above). Usually this is a chore reserved only for women, but Mike helps me out and we work as a team. 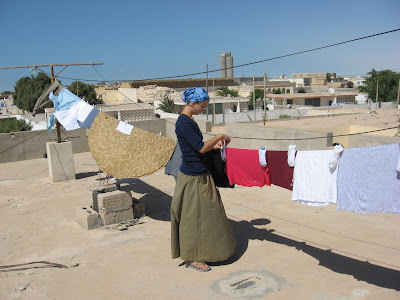 I clean the clothes with soap by rubbing and squeezing water through them with my hands (not nearly as well as the Mauritanian women). After I'm done wringing them out, I give them to Mike who uses a bucket of clean water to rinse out the remaining soap and then wrings them out again. We usually do all the washing inside the house in the bathroom. Then we carry the wet clothes up to the roof, where we hang them out to dry in the sun. We usually have to clean off the clothesline first though, or we will have a line of dirt on our nice clean clothes. Otherwise we are doing well. Today we got several care packages in the mail. Thank you Lori, Aunt Liz, Dad, Annie, Bob & Karen! We've also received packages from several families from St. Martin's Lutheran, and I keep reminding Mike to write thank you notes. We really appreciate all you are doing, even if we aren't always the best about sending a note in return! I also want to say thank you to Kathy Miller for sending me my stethoscope! I thought it was gone forever! Hope all you ladies at the Birthplace are doing well. It was great to talk to Michelle, Stacy & Di on the phone last week! I'll try to call again soon. We can hardly believe this week is Thanksgiving! It has gotten much cooler here recently, but nothing like the cold weather you're having back home. Generally the temperature in our house stays about 70-72 degrees, so I'd estimate that it ranges from the upper 50's at night to high 70's during the day. We won't really get a break for Thanksgiving since it is only a holiday in the U.S., but we have plans to celebrate on Friday with the other PCVs here in Nouadhibou. I'm going to try and make a pie, but I'm a little worried about how it will turn out since I've never actually made a whole one by myself. Wish me luck! Love you all! Happy holidays! 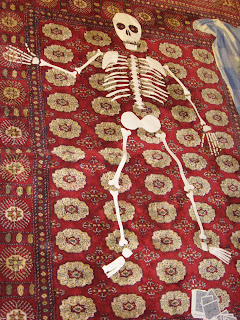 Upon entering their new apartment, Mike and Katie couldn't help but notice the potential this dwelling possessed. Sweeping archways, French doors, electricity, toilets, the possibilities were endless. However, it was currently a dirt-ridden, paint-strewn mess. A remnant from the 1960s, this apartment still had large windows and natural light from a warmer time in Nouadhibou. Since the 1980s, things have cooled, resulting in newer homes built with small 10x10" windows and similar cookie-cutter room patterns. After one day in their new place (and one dinner), they noticed, to their horror, an army of ants hauling away the smallest bits of forgotten food. 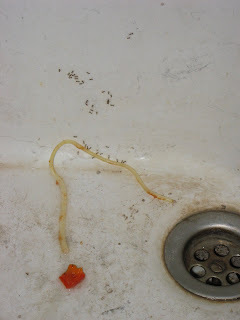 There was even a large slice of onion caught in the drain that 10-20 ants were hauling to a crack between the sink and counter! Considering ants can haul 50 times their body weight, this was no small feat. After waging war with the scouts, drones and soldiers, Katie and Mike thought, "surely only the queen remains!" But alas, this was not true. A colony of hundreds, thousands...nay MILLIONS! was ensconced in the walls and had no plans on moving. As if this wasn't bad enough, cockroaches controlled the bathroom! They were waging two seemingly endless wars with little resources other than fingertips (vs. ants) and flip-flops (vs. cockroaches). Something had to be done. 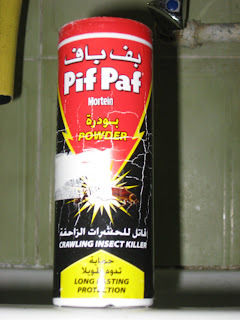 Puffing poisonous Pif-Paf powder puts pests in a precarious position? Or perhaps a pest placebo pthat pdoesn't pwork. The cockroaches seemed held at bay for a while only to make a resurgence in early November. The ants even seemed to be marching away with bits of the stuff almost as an 'up yours' to the diligence of Mike and Katie. With the Pif-Paf cannister running on empty and home remedies such as salt, vinegar and plugging drains exhausted, things looked bleak. Were Mike and Katie doomed to wave the white flag and try to live in peace with the intrusive albeit native inhabitants? NO! Just in time, a package from home. Mike's mom and dad send in reinforcements in the shape of Raid rtm ant and roach traps. Only time will tell, but so far, only two-legged creatures are welcome and safe in 'el douze say,' Kra Nasrani, Nouadhibou. On a more personal note, happy belated birthday to my brother Monte! He was born on a Friday the 13th. Katie and I were engaged on Friday the 13th. Lucky day for our family. As the title states, this slideshow will demonstrate how to make the traditional Pulaar dish of Hakko, which is a meal of couscous and bean sauce served frequently in the villages of southern Mauritania. Choose your own adventure. We cooked good, old-fashioned hamburgers that were marinated in none other than KC's own Gates BBQ Sauce (I brought a jar from home). Oh how I miss the BBQ. Maylen bought a tasty Happy Halloween monogramed cake. 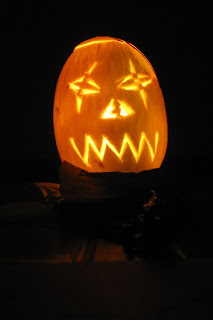 We also carved a jack-o-melon (no pumpkins available) and bobbed for apples (see below). Last but not least, we watched the first 9 "Treehouse of Horror" episodes of the Simpsons. Not too shabby. School is going well and is in almost full swing. I only have one class that hasn't commenced because of registration problems and they are going as smooth as I could have imagined. Some I can already tell will be more or less difficult that others. I was really nervous to teach the adult classes because many of the students, if not all, are older than me and very many are teachers themselves. But many adult students assured me I had conducted a good first lesson and they seemed really enthusiastic about learning English. On Wednesday night the power went out and we continued the lesson by the light of cell phones; it was great. We'll see if they all continue to come. Also, next Friday, I will start a general music appreciation/history/performing/I don't know what the hell I'm gonna do class at the girls mentoring center. I really need to put in some planning this week to come up with concrete ideas that will actually work. Please comment if you have any! Ha! Today will also prove to be significant for me and many I know because my good friend Andy Young is getting married. I am an honorary groomsman and it kills me that I can't be there in person. He's marrying Jamie Cox, a wonderful woman (even though she grew up in Mizzurah) who, from what I have observed, is truly his best friend - because a lot of us just don't like him that much...just kidding Andy! Seriously though, congratulations, we love you guys. Mike has finally begun teaching classes, and although attendance is still sporadic due to continued problems getting everyone enrolled, there seem to be more students every day. He is teaching 14 hours per week, which is actually quite a lot. He has seven 2-hour block classes a week. All his students are in their final (6th) year of secondary school, and are preparing to take "the BAC." The BAC is roughly equivalent to the SAT or ACT in the U.S. (only more difficult I think since there is only about a 7% pass rate). I'm sure Mike will fill you in soon on how things are going with the classes. As for the schedule, Mike teaches from 8 am-2 pm on Monday, 10 am-2 pm on Thursday, and 8 am-noon on Saturday...yes, that's right, students have class here on Saturday! And I guess I'll take the opportunity now to also explain that Mauritania, as an Islamic republic, recognizes a different work week than Western societies. The holy day is Friday in the Islamic faith, and therefore, it is not a work day. Most businesses take Friday and Saturday off, and resume their work week on Sunday morning. Additionally, Mike is teaching extra "adult" beginning English classes twice a week in the evening to community members who have expressed interest (almost everyone here wants to learn English). The class consists of everyone from taxi drivers to school professors to government officials. Okay...so I know what you're thinking...that's a lot of information about what Mike's been up to, now what about Katie's activities? Well, it's a bit difficult to explain, but I think the best way to explain my job is to say that I'm a "community organizer." Yes, I'm aware that this term has become somewhat politically charged in the U.S. in recent weeks, but honestly, that's what I'm doing. The focus of my organizing is on health education activities for both the community at large and for health professionals. My job is a bit difficult because it is very unstructured. I set my own schedule and determine my own priorities each day. Of course I received a lot of guidance during pre-service training on where to start initially...language acquisition, community integration, and knowledge of the communities strengths and weaknesses from a health standpoint. I also have a wonderful APCD (Assistant Peace Corps Director) named Daouda, who I can call or email if I have any questions or worries. Just to clarify for any who may still be confused -- I am NOT working in Mauritania as a nurse. I do not take care of patients, or provide treatment of any kind. 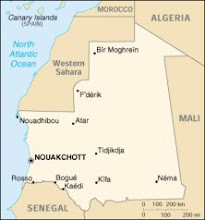 I am not allowed by Peace Corps or licensed by the Mauritanian government to work as a nurse here for many reasons, which include my personal safety and liability. Although I may be observing some health care provision, in order to educate and/or improve processes, I will not be providing any care myself. So...up to this point I have been primarily focusing on visiting the various health clinics, hospitals, and health NGOs (non-government organizations) that work here in Nouadhibou, as well as schools and other organizations. I am looking for potential project ideas, identifying motivated individuals, and trying to determine the health priorities of the community from their perspective. This evaluation will be a continuous process throughout my service, even after I have identified some projects to focus on. The goal is to try to create sustainable change...you know, work that will continue to be of value after I leave Mauritania. Other than "work," my focus is on meeting community members, and becoming friends with them, another goal of Peace Corps. I continue to work on language skills, improving my French beyond the daily survival skills necessary for the moment, and picking up basic phrases in Hassaniya and Pulaar for greeting and communicating basic needs. I take African dance class twice a week for personal health and enjoyment, though the dancing style is really more Senegalese than Mauritanian. That's it for now...because this has been a long enough post already. Maybe next time I'll discuss our normal routine for daily chores or preparing meals...as the process can be quite a bit different here from the way things are normally done dans les Etats Unis.